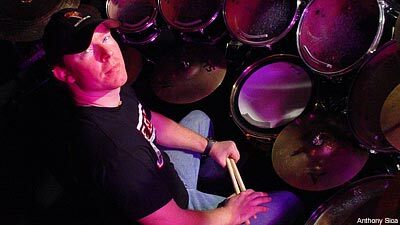 To the general public, multi-talented entertainer Richard Christy is best known for his work on 'The Howard Stern Show,' but metal fans should already know there's another side to Christy that relishes the onstage life -- not the booth of a radio studio. Since 1996, Christy has played drums on albums by Acheron, Death, Control Denied, Burning Inside, Iced Earth, Leash Law and his new band Charred Walls of the Damned, whose self-titled debut album came out Feb. 2. When we asked Christy to submit an iPod shuffle list, we figured it would contain mostly underground death and black metal bands. And while we could have predicted that his list would came back with entries by acts like Amon Amarth, Lamb of God, Nevermore and Gwar on his player, some of the selections were pretty surprising. For instance, George Strait, Joe Diffie and Alan Jackson; who knew Christy was a country music fan? "I have a very good explanation," he told Noisecreep. "I grew up in the great state of Kansas. I love listening to country music, because it reminds me of home. I also think country music singers have some of the most amazing voices in all of music. Alan Jackson's voice is unmatched in country music in my opinion." Okay, fair enough. But what's a guy who once played in Acheron with Vincent Crowley -- one of the most Satanic dudes in America -- doing listening to '80s Christian rock bands Stryper and Barren Cross? "Although I am not a religious person, I thought there were some great Christian metal bands in the 1980s," Christy said. At least he didn't mention Petra. The inclusion of comedy sketch artists the Jerky Boys makes perfect for Christy's iPod considering the fact that he now makes his living in part concocting prank phone calls for 'The Howard Stern Show.' "They paved the way for what I do on the show," Christy said. "Kamal and Johnny B are my heroes, and they are comic geniuses." In the final analysis, Christy is an avid music fan with eclectic tastes that transcend the extreme metal subgenre he's associated with. He'll cop to liking commercial metal, including Mötley Crüe, and also digs emo/alternative bands such as Finch and Coheed and Cambria. And he's got a thing for film director and composer John Carpenter, as indicated by two of his iPod selections. "I listen to tons of horror soundtracks, especially John Carpenter's films," he said. "John Carpenter is probably my all-time favorite musician and composer. I think he is a genius, and his songs are simple but so effective, and they give me a chill every time I hear them."